I just have to take a break from my regularly scheduled t-shirt line review to bring you what may possible be the t-shirt of the year. And I know what you are thinking…..how can you make that claim in January? It’s easy, when you see this shirt, you will understand completely. 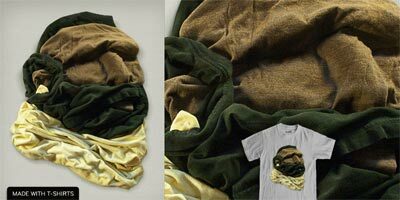 This magical design was created by Murray Mullet with three real t-shirts. No photoshop, no illustrator and the only thing digital is the photograph of it. Go check out the comments to see the hype and appreciation.